'Tis the 'season of mists and mellow fruitfulness'. Hopefully we won't have too many mists just yet, as summer seems to have returned for a few more days, however I am looking for some fruitfulness as September's Slow Cooker Challenge is cook with FRUIT in your slow cooker. Your dish can be sweet or savoury as long as it contains some fruit. My recipe is a simple one, I love baked figs and thought it would be easy to pop them in the slow cooker and it worked really well. 1. Cut the hard part of the stem from the top of the figs, then slice a cross into the top of each one, be careful not to cut all the way to the bottom or your figs will fall apart. 2. 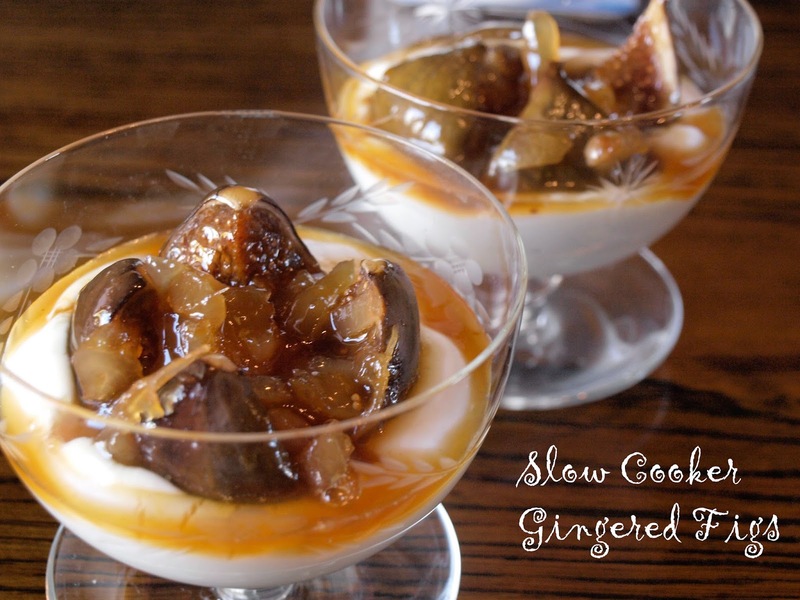 Place the figs in the basin of the slow cooker, open out the sections of the fig a little and fill the space with a dessert spoon of Ginger Preserve. 3. Pour the orange juice around the figs and cover with the lid. 4. Bake on low for 2-3 hours. 5. Remove the figs from the slow cooker to a serving dish, pour the juices into a pan and bring to a rapid boil, reducing the syrup by half, then pour this over the figs and chill in the fridge for at least an hour. 6. Serve with greek yogurt, drizzling the syrup over the figs and yogurt. If you use twitter, tweet your post with @FarmersgirlCook and #SlowCookerChallenge and I will re-tweet it to my followers AND post your picture on the dedicated Pinterest Board. You had me at the words gingered figs Janice - they sound wonderful. Looking forward to seeing what you make., Karen. Apple and fig loaf sounds good, Dom. I love both ingredients too, I guess you could improve with chocolate! Gosh that must have been very tempting. It works for me, Rebecca. I love figs - never thought of cooking them in a slow cooker!! These look lovely - I'm thinking they would be really good around Christmas time with the ginger. I've just invested in a slow cooker, so shall be entering the challenge this month! !